Porta Andalucia - your leading real estate agent in Puerto Banús! You are looking for a property for sale in Puerto Banús, or have a question regarding our real estate offers in Andalusia? 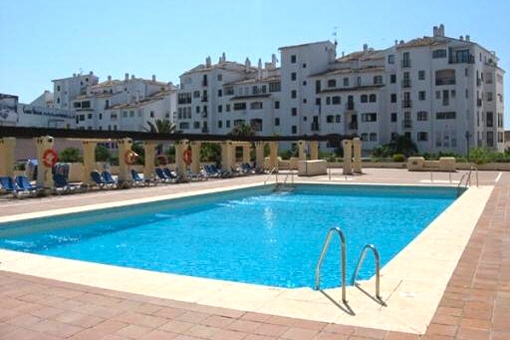 You were not able to find the ideal apartment in Puerto Banús? Then please call us on +34 971 720 164, or send us an email to info@portaandalucia.com. Our Porta Andalucia real estate agents in Puerto Banús will be pleased to asist and will help you find your dream property. This apartment is located in Marina Banús, a residential area in the heart of Puerto Banús, at only 200 meters from the beach and very close to the golf course, restaurants, shops, supermarkets, banks and cinemas, etc. Puerto Banús is a marina in Marbella. It was built by José Banús and was inaugurated in 1970.Today the port is the meeting point of the "rich and famous". The mooring fee is partly 500,000 euros per square meter. The largest yachts are up to 70 meters long. Especially rich Arabs have berths there. The restaurants and shops you can find in the harbor are accordingly in the lower price positioning. Furthermore, the marina of Marbella is the center of the nightlife of the Costa del Sol. you are reading: Puerto Banús: Property for sale in Puerto Banús, Andalusia · Porta Andalucia Rating 5,0/5 by 2 testimonials.